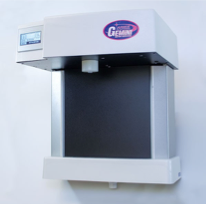 The GEMINI Ultra Purity Water System provides up to 3.7 liters per minute of 18.2 megohm, 0.2 micron filtered water. The Multi-Pass Ultraviolet System irradiates the water at three separate passes in the recirculation loop. The dispensing port os continuously exposed to UV for complete sterility at the outlet. Water quality meets or exceeds ASTM, CAP and NCCLS Type 1 Specifications and meets ASTM biomedical grade specifications.